“Lamenting” is not an option on Facebook for how you’re feeling when you post a status update. But it’s a valid emotion we see over and over again in Scripture. When reading through the book of Psalms, you can’t miss it. People get sad and they tell God about that sadness. They explain their pain, frustration, worry, and anger by lamenting. I also see it throughout the gospels and Acts. When someone begs Jesus for healing, when they mourn the death of a friend, or when the disciples are scared. They are all times of lament. When I have gone through times of sadness or anger, two things have brought me comfort—sighs from Scripture and songs. Sighs are phrases I can repeat over and over, when it feels like that’s all I can get out. And songs include hymns of old and those popular today I want to share them with you in hopes they can comfort you as they have comforted me. “How long, O Lord?” When you wake up each morning and the burden is still heavy, you want to ask God how long it will go on. How long must I suffer? How long will my loved one be in pain? How long until You make this right? But every person who has asked this question has seen an end and can speak to the hope you hold on to in waiting. “Do you not care?” It’s so easy to think God is absent in times of suffering. Mainstream American Christianity has deceived many into thinking that turning your life over to God means it will be an easy road with heaven waiting at the end. When tragedy hits, you think He has left you. This can’t be what He wants for your life, right? Suffering in this life is a result of sin, and it certainly isn’t what He wanted for any of our lives. He is working every second of the day to draw people to Himself and eventually set right all that is wrong. He cares more than we know. “I cry out!” I’m a little passive-aggressive. Which means when someone asks me what’s wrong, my first response is “Nothing.” But with God, we can be completely honest. We don’t have to hold it in. We can cry out. We can wail. We can soak our pillows with tears or bang on the steering wheel until our fists are bruised. God created us with the capacity to feel many emotions and He can handle them all when we need to express them. 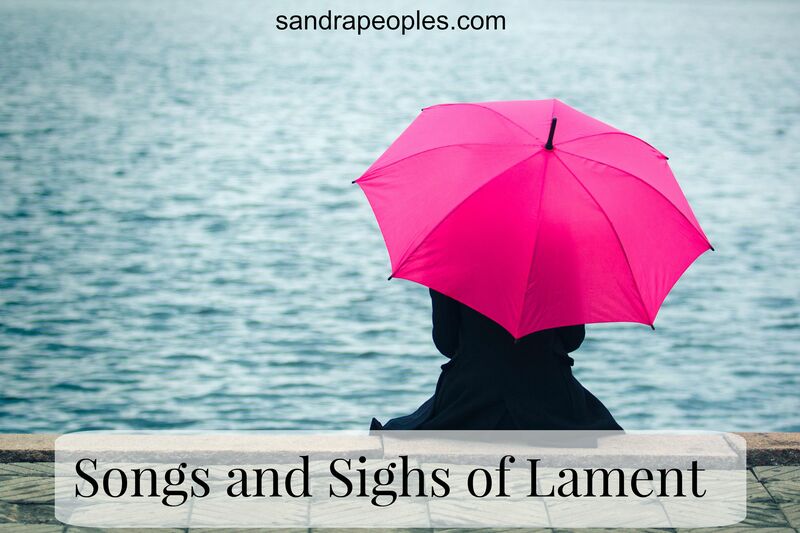 Whether we’re singing them corporately with our church families or listening to them in a quiet room at home, songs can bring us comfort when we lament. Here are three that helped me hold on to hope. Lamenting is healthy and helpful. When trials come, it’s best to cry out to God. He is gracious and good to us, especially in our pain. I really appreciate the wisdom in this post. Thank you for choosing lamentations that aren’t well known. I agree with every word, especially in your final paragraph. And I’m so glad the Jill Phillips album has blessed you.